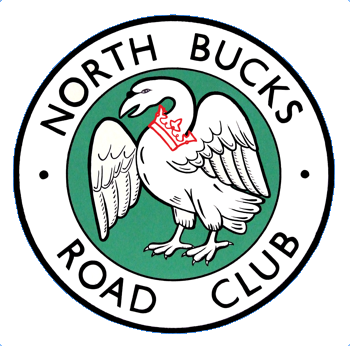 The latest news from the North Bucks Road Club, including club news and announcements; club events and results; news relating to the wider cycling community. Club event results are periodically moved to the "Club Events" area, accessible from the menu above. Our next club night is on Monday December 9th in the club room, from 7.30pm. We should be making the final arrangements for the club kit order - so come along if you'd like any of the items. Darren has the literature from Bio-Racer, but most probably the samples will have been returned (they looked pretty good). It's likely that our presentation will be in January, so we need all trophies to be returned for engraving - this meeting would be an ideal opportunity to bring them back! This is mine and Adriana’s standard Peaks ride, plenty of climbing, epic views and speedy descents. PLEASE, warm clothing, real food in your pockets, mudguards and at least, 39-27 needed or compact 34-25; you do need to prepare for this ride! The NBRC managed to get a load of members on such a ride a good 15 years ago. YHA costs can be as low as £90 for six of us all in including breakfast or we can secure more deluxe places for £65 to £75 for double room in a B and B. Looking to go soon just 4 or more riders needed. Average speed not important, this trip is to enjoy good riding and good food! Hoping the start to be based in or near Tideswell. Drive down on the Friday, excellent food in the local pub. Up early for 9am start . Onto Millers Dale, Taddington, Chelmorton, Longnor, stop at the Monyash Café. Then we will head down and across to Youlgreave, Rowlsley alongside the river for a bit towards Baslow, right at Calver then left onto the mighty Abney Climb. Next onto 45 mph descent to Bradwell. Turn left 5mph ascent (16 percent plus) over the moor to spat out into Castleton. Up Winnats pass, super-fast down into Chapel Le Frith, onto Dove holes (with only a choice of 10 or 16 percent climbs to get there) The magic sounding Wormhill 2.5 mile descent will finish our ride. I have done this route at least four times or variations of it, it can be extended in length for Steve! New coffee shop in Cranfield spotted , report to follow if they let us in! NBRC Club Meeting 11th December, 7.30pm onwards. All members welcome! The Bioracer kit samples have arrived - I will bring them to the next meeting up at the club room (which I believe is next Monday?) 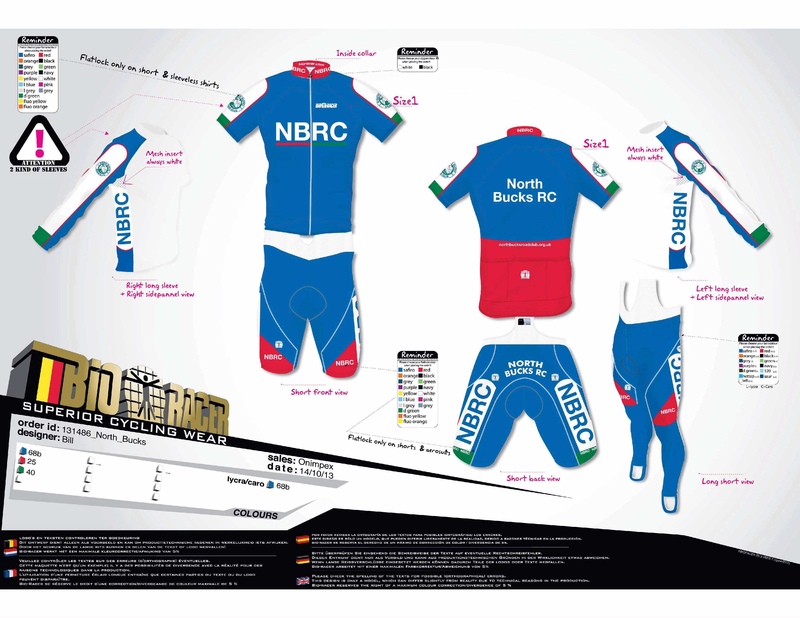 for anyone wanting the new kit to try on. If you're interested in buying new club kit, this meeting would be worth attending! If there are further items for the agenda, I'll post them here. In the meantime, here's what the new kit will look like (click on the image for a bigger version). Here's the list of times for the Brickhills Challenge, sorted by number. The Brickhills Challenge was originally an early season Reliability ride at the end of February for the racing guys to hone their early season form. With a succession of hills and narrow lanes it was also ideal for the new breed of sportive rider training for Flanders. After two years in a row being snowed off the event was switched to October. The Brickhills are on the southern border of Milton Keynes. You are never more than 15 kms from HQ. The course includes 14 climbs including Bow Brickhill, the steepest at nearly 20%, which was used by the Milk Race one year. This is only 300 metres from HQ so ideal for spectators. Three Locks is the longest climb at about 1.5 kms with gradients of 6 to 10%. Riders pass through beautiful villages including Aspley Guise, Great, Bow and Little Brickhill, Woburn and Drayton Parslow. The 52 mile (85 kms) course should take between 2hrs 45 mins and 4 hours to complete. Given the relatively short distance there are no feed stops. Every rider will be given a bottle of water at the finish and can enjoy free tea and coffee, cakes and sandwiches at event HQ. Random spot prizes will be awarded and there will be prizes for best classic racing bikes. Apologies for the late notification (I've been on holiday in France), but we've a club meeting on Monday 9th September 7.30pm onwards. All welcome, come and discuss club business in advance of next month's AGM! Starts at Jack’s Hill Cafe on the A5 north of Towcester. Army Benefit Fund Soldiers Charity Ride. Starts at The Five Bells Stanbridge. 26 or 64 mile signposted and marshalled route, complementary Hog roast at the finish for riders. I guess you may already be aware but, just in case you are not, Steve Abraham has managed to set a new club 24hr record. It now stands at 449.44 miles. Only last year it was set by Steve at 448.193 miles. Former NBRC rider Geoff Bunyan smashed his previous best of 392.770 with a new PB of 420.21 miles. As ever, report any website issues to Robert.